The hospital in Prague which treated five-year-old Ashya King for a brain tumour, has confirmed he received no chemotherapy - a key part of his original treatment plan. His father said he did not need it as the tumour was now "in remission". But a leading UK cancer expert has said, without chemotherapy, children's chances of survival could be reduced. 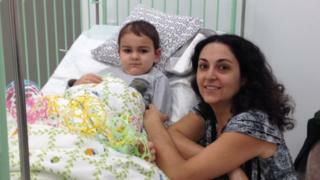 Ashya is being cared for at a private hospital in Spain and is receiving physiotherapy and speech therapy. He is said to be doing well, and even saying a few words. Ashya's story received global attention in August when he was taken from Southampton General Hospital without medical consent, sparking an international hunt. His parents Brett and Naghemeh, of Southsea, Hampshire, took him to Spain where they were arrested and held in a prison in Madrid. They had wanted him to undergo proton beam therapy, which had not been recommended by doctors treating him. The couple were later released and the NHS agreed to fund his treatment in September. Speaking after Ashya finished a course of proton beam therapy at a special clinic in Prague, his father, Brett King, said he did not need a separate course of chemotherapy. He said: "We came to a conclusion [with] the doctors that, really, he doesn't need it... They've done MRIs that don't show any visible signs that there's a tumour - it's in what they call remission." The Motol Hospital, where Ashya had been staying, confirmed no chemotherapy had been given. But a leading cancer expert said, without chemotherapy, the survival rate for children with medulloblastoma - the type of tumour Ashya had - could be significantly reduced from 80% to about 50%. Prof Roger Taylor, vice president of clinical oncology for the Royal College of Radiologists, said chemotherapy in conjunction with radiotherapy was the "standard course of treatment - without exception" for children with that type of brain tumour. He said: "For the last 15 years or more we have been using chemotherapy routinely for all children. It's been known for several decades that medulloblastoma responds well to chemotherapy." NHS England is expected to pay up to £80,000 for Ashya's treatment in Prague. It has so far not commented on the latest development. Dr Cortes Funes, who is caring for Ashya in Spain, told the BBC the boy was doing well and the medical team was waiting to decide what treatment to give him next. He said one option may be a course of immunotherapy, which uses antibodies and stem cells to boost the body's defence against cancer.